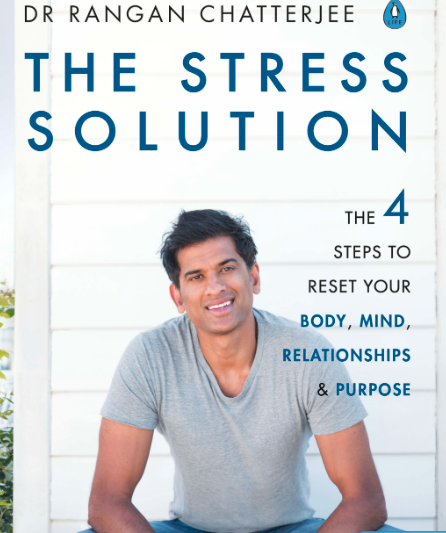 Dr Rangan Chatterjee believes we are living in a stress epidemic and it is affecting, amongst other things, our sleep. We've invited him to take part in a Q&A on Gransnet so that you can ask him for tips on feeling healthier, happier, less stressed and more rested - think we can all do with a bit of that! He is one of the most influential doctors in the UK and is changing the way that we look at illness. 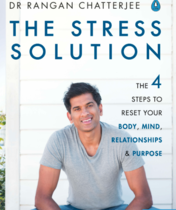 He is known for taking a 360 degree approach to health, which was highlighted in his ground-breaking BBC TV show, Doctor in the House, and in his first book The 4 Pillar Plan. He is the resident doctor on BBC One's Breakfast, a regular commentator on BBC Radio and hosts his own chart-topping podcast, Feel Better Live More. We have two copies of his new book to give away to randomly selected posters on this thread. I may be beyond help! I have a bedtime routine, dark curtains, no devices after 9pm, bedroom not too warm, no coffee after lunch, no daytime naps, no alcohol and now not even watching the news before bed. What else can I do? Doc prescribed Zopadine for every other night and also an anti-histamine for the other nights. Sleeping pill works so I get a bout 6 hours every other night, a-h didn't work so I stopped. I have pillow sprays, take a herbal pill from Holland and Barrett and have been taking magnesium for a month. I'm exactly the same as previous poster Nonnie. I have tried everything (apart from sleeping tablets - I don't want to go down that route if I can help it) but it seems to be getting worse - now I have about one evening a week when I'm still awake at 2 or 3 am. Every other evening I just seem to doze, waking every couple of hours. I never feel like I've had a deep sleep. I'm not stressed about anything and I try to get out in the fresh air every day. This has been going on for years and now I read in the papers that it can damage your health so I am seriously concerned. Hot flushes/chills wake me regularly throughout the night. I'm exhausted. They're exacerbated by stress for sure. And I am a worrier. HRT is an issue as I am progesterone intolerant and have migraines. In also have cervical spondylitis which presents with awful pain that shoots down my arm, and up over my head into my eye socket. It doesn't happen often, but right now it's been going on for over 2 weeks and is also stopping me sleep, stressing me out and probably making menopausal symptoms worse. My sleep pattern was disrupted when I had chemo over 23 years ago and it has never returned to "normal". I am lucky if I get 2/3 hours sleep and often have nights when I literally don't sleep at all. I tried sleeping pills years ago but they didn't work, I have a herbal tea 30 minutes before I go to bed, don't use phone or laptop in the bedroom, have tried relaxation and hypnosis CDs but nothing helps. I know I am stressed as we have had serious illness in our immediate family. My sleep pattern is generally poor and I wake frequently in the night, sometimes getting little more than 90 minutes sleep in one go which worries me. I do not need to get up in the night but have tinnitus and use a radio and have become very knowledgeable on the BBC world service output. I have never been able to nap during the day, which is truly annoying but I still cope. Will this fragmented sleep pattern damage my health? Any advice gratefully received. I’ve never heard of him but love the name Chatterjee and would be happy to read him. I’ve had sleeping problems for over ten years. Spent a fortune on alternative remedies, tried acupuncture, hypnotherapy etc. Seen my doctor several times - who gave me no help. It did start with a period of extreme stress. Several periods if I’m honest. But having tried everything I can think of. Now I accept. This is me. Some days I can function and some days I can’t. I have to live with it. What is the optimum length of sleep per night? I have always slept for no more than 5 hours, but it doesn't worry me, I just get up between 4 and 5 am, have a long soak in the bath with a book, then a walk. I am never sleepy during the day and feel alert. Can this really be harmful or just a healthy normal pattern for me? Pre menopause I could sleep all night and feel rested, now getting to sleep is just the first hurdle. I use guided sleep meditation and audio books but this means using an earpiece in the hope of not disturbing my husband. This can be uncomfortable and cause a sore ear. Having constant night sweats that involves throwing off and on the sheet and/or quilt unfortunately disturbs my husband. When I eventually go to sleep my husband will often get up for a loo visit and because I sleep so lightly, I am then woken with no hope of returning to sleeping for at least an hour or more. To top it all I also suffer from night time acid reflux. So by morning instead of being rested and refreshed, I feel I have gone a few rounds in the boxing ring. After several disturbed nights and when the exhaustion is too much to bare, I resort to Piriton antihistamine tablets and decamp to the spare room. I too have very inconsistent sleep patterns and have done so for many many years. I also suffer with tinnitus, which I am certain does not help. I have taken to wearing an eye mask and earplugs, not sure if it is a placebo effect, but with these I get a few hours sleep (some nights). Like so many posters, I am very concerned what impact my poor sleep hygiene will have on my long term health. A combination of menopausal symptoms and listening out for teenage daughters getting home safely sabotaged my sleep pattern. 20 years later it is still erratic, despite trying all the “sleep hygiene” tips I often have far less sleep than I think is good for me. As I get older I do find it harder to function if I’ve only had 2-3 hours sleep and am inclined to get a bit grumpy! I take antihistamine if I’ve had a few bad nights which does help a bit. I’m forever reading about poor sleep causing weight gain, raised blood pressure and diabetes. The first 2 do apply to me and it worries me that long-standing lack of sleep is adversely affecting my health, it certainly affects my energy levels. But I suspect that if I spoke to my gp about this I’d be sent off with a flea in my ear... that’s assuming I could actually get an appointment! I fall asleep but wake through the night hot flushes and asthma not a good combination! I've tried various remedies but feel nothing really works. I tend to stick to calms to relax me but only take. Edge off. I do feel the lack of sleep plays havoc with my work and daily routine. Don't know the answer just counting sheep and reading!! I didn't know you have a podcast, off to search for it, if the annoying "sounds" will not be too awkward. Having children and breastfeeding ruined my ability to get a decent night sleep on a regular basis. Then just when my sleep pattern had improved, along came the menopause! It's affecting my husband's sleep too, so is there any hope of improving the situation any time soon? Amongst other things, it's driving me to stay downstairs some nights. So here I am on Gransnet 6am. awake from 4am with pain in shoulder. gone now after applying Pernaton and taking paracetamol. But still awake! I sleep well a few nights although never more than 5-6 hours. then for some unknown reason pattern changes and I'm awake from 1-5am or thereabouts for a few nights. Can't figure out why it changes. Infuriating and depressing and extremely tiring. can't function properly during the next day. Then pattern reverses again! Best sleep I have is if I have a glass of wine with dinner at 6pm and a paracetamol at 11pm. Then I could sleep until 8am. But I don't do this regularly. Don't want to get used to it. OMG I am entirely the opposite- I can sleep for London. Although I have to get up during the night more than once to go to the loo I soon fall asleep again. If it was not for my cat persuading me to get up I could sleep for around 10 hours a night but she only allows me 8 hours if I am lucky. I still have the odd snooze during the day. I try not to but it happens. I may have a couple of sleepless nights each year. I would do pretty much anything to be able to sleep for longer than the 90 minute cat naps I've has for the past decade or so. It makes no difference what time I go to bed; whether I have a drink or something to eat, temperature of the room etc; 90 minutes is the most I sleep for. And that's pretty rubbish when I have to be up for work every morning. Sometimes, on a Friday night, with the prospect of no work the next day, I have a gulp of Night Nurse and that helps a bit. I can usually get off to sleep fairly easily now, but I often wake in the early hours and find it so hard to get back to sleep again. Sometimes I’m woken by a need to go to the loo, sometimes it’s because I get cramp in my toes and sometimes it’s just because I wake up! Lately, it’s been the cramp in the toes. I used to sleep like a log, whatever problems I had, however bad things were. Now though, I wake with a start, usually 1.5 hours after I've nodded off, and that sets the pattern for the rest of the night. To add insult to injury, my sister, when she stayed here asked me if I have nightmares. She says I spent all of the time I was asleep crying "Noo! Oh please no!" Sounding really distressed. I just remembered, I also shout "it hurts! Its hurting me!" all night, too. Like MissAdventure, I cannot stay asleep! I don’t ofterntjace any problem getting to sleep, but wake with a start usually between 30 minutes and an hour later, then can’t get back off to sleep. I often have restless legs which seems to happen just as I’m dozing back off. I work three early mornings so up at 4am on Thursdays and 3 am Fridays and Saturdays ... so it’s difficult to keep to a bedtime. I’m getting to the point I don’t think I can continue with my job because the lack of sleep (on top of the menopause) is having an effect on me generally now. Goodness MissAdventure that sounds awful. I wonder what causes the nightmares.